At Faith everything we do is grounded in worship, where we reliably encounter the living God in scriptures, sermons, and the sacraments (i.e., Holy Baptism, Holy Communion). 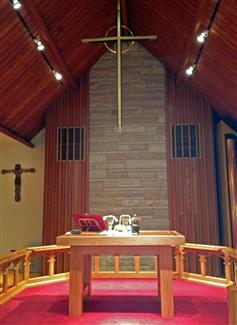 Lutheran worship, known for its strong musical tradition, uses a liturgy taken from Bible verses. Weekly scripture readings follow an ecumenical lectionary matching the church calendar. Learn more. Sundays. Holy Communion at 8:30 & 11:00 am, and 6:00 pm. A nursery for children, kindergarten age and younger, is available during morning services. Children Worship and Wonder. During the school year, children ages 3-7 can spend a meaningful time with God in a worship environment for them that follows the pattern of the adult worship service (Gathering, Word, Meal, Sending). Children and leaders move slowly, speak quietly, and use silence to encourage thought and wondering about God. For more information, please contact Joan Sorenson. Youth in grades 4 - 8 are encouraged to serve as acolytes. Youth in grades 7 - 12 can serve as crucifers and torchbearers in festival worship services. Adults assist in worship by reading the lessons, leading the prayers, and assisting in the distribution of Holy Communion. Adults also serve as sacristans, who prepare the altar for worship. See Music and Visual arts for additional leadership opportunities.